With the failure of Congress to repeal and replace the Affordable Care Act, commonly known as Obamacare, Democrats in Wisconsin are again calling for Governor Scott Walker to change his position on expanding BadgerCare, the state’s Medicaid program. 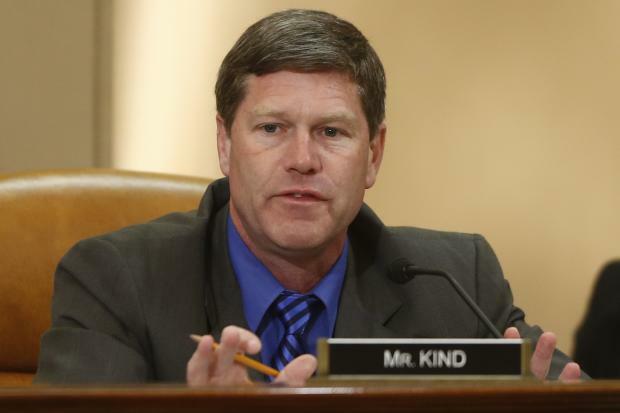 The latest call comes from Congressman Ron Kind, D-La Crosse, who sent a letter to Walker on March 29 asking him to accept increased federal funding under Obamacare in order to raise eligibility for receiving Medicaid to everyone under 138 percent of the federal poverty line. We’re going to assume that Kind’s $1 billion “net savings” is the number from the Legislative Fiscal Bureau’s (LFB) memo on Medicaid expansion requested by Senator Jon Erpenbach in 2015. The LFB found that, using the Obamacare reimbursement rates available to states at the time, Wisconsin would have “saved” $1.07 billion in general purpose revenue (GPR) for the state through the 2021 fiscal year. However, the projected budget “shortfall” to which Kind refers is for the biennial budget in 2019-21. Given that this is already 2017, the “net savings” to GPR is only $392 million by the next budget, not $1 billion as Kind wrote. No wonder the federal government is $19.86 trillion and growing. Kind also ignores that the so-called projected shortfall isn’t a real deficit at all, but a projected cost-to-continue. Unlike Washington D.C., where the actual budget deficit is $559 billion, Wisconsin has actually experienced a surplus after every one of Walker’s budgets. At the end of his letter, Kind suddenly remembered that the money that funds for the federal government actually comes from taxpayers. What Kind should be doing is working with Republicans in Congress to repeal Obamacare instead of trying to expand Medicaid in Wisconsin which will only make matters worse for Wisconsin taxpayers. While there is a savings in GPR at the state level, overall taxation has to go up, or more borrowing has to occur, for any Medicaid expansion. Expanding Medicaid in Wisconsin will actually cost taxpayers $1.15 billion in increased federal spending over the next budget cycle for a net loss to taxpayers of $761.8 million. By the end of the 2021 budget cycle, instead of saving taxpayers $1 billion, the projected net cost (increased federal spending minus GPR savings) of Medicaid expansion in Wisconsin is actually $1.59 billion. So much for saving Wisconsin taxpayers $1 billion. The LFB memo is a rosy scenario that assumes the federal government does not change the reimbursement rates for Medicaid expansion, even if congressional Republicans and President Donald Trump are unsuccessful in repealing Obamacare. We’re past the window of 100 percent reimbursement for Medicaid expansion, and Kind would probably agree that it’s unlikely Congress will suddenly increase spending for Obamacare expansion. The current schedule for declining reimbursement is 95 percent for 2017, 94 percent in 2018, 93 percent in 2019 and 90 percent in 2020. It’s not hard to imagine a scenario where those reimbursement levels are lowered ahead of schedule and even more drastically as Congress wrestles with its budget deficit. President Barack Obama actually proposed decreasing the rate of Medicaid reimbursement for the normal caseload not included in the Obamacare expansion. Given that precedent, surely governors and legislatures that are placing their trust in the current Obamacare reimbursement rates are cheerfully marching their states up the stairs to the fiscal gallows. It’s also worth reminding Kind that expanding Medicaid, the “health care we have paid for,” is not a good health care option. Medicaid patients are limited in their physician and health facility choices due to Medicaid’s low reimbursement rates for providers. One study of Oregon’s Medicaid expansion found it did not improve health overall and actually increased visits to the emergency room by 40 percent. Kind shouldn’t expect a different health care outcome from Medicaid expansion than from the sprawling Veterans Affairs hospital system, which Kind is familiar with now, and neither should taxpayers. Wisconsinites should ask Kind, if the system isn’t broke, why are you proposing a replacement that will cost more money and not work as well as what we have now?